BRYMNER, WILLIAM, artist and educator; b. 14 Dec. 1855 in Greenock, Scotland, son of Douglas Brymner* and Jean Thomson; m. 12 Sept. 1917 Mary Caroline Larkin, née Massey, in Montreal; they had no children; d. 18 June 1925 in Wallasey, England, and was buried there. William Brymner was an influential art teacher and a distinguished Canadian figure and landscape painter. Born in Scotland, he moved with his family to Melbourne, Lower Canada, in 1857. He first attended St Francis College in neighbouring Richmond. In 1864 his family relocated to Montreal. Brymner completed his studies at a private school and at the Petit Séminaire de Sainte-Thérèse in Sainte-Thérèse-de-Blainville (Sainte-Thérèse). In 1870 he was briefly apprenticed to Montreal architect Richard Cunningham Windeyer. 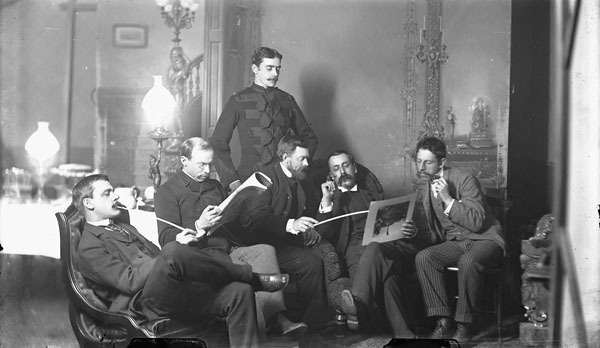 He also attended night classes at the National Institute of Fine Arts, Sciences, Arts, Trades and Industries, founded in 1871 by Joseph Chabert*. His father’s appointment in May 1872 to the federal Department of Agriculture as clerk in charge of archives (he would become head of the Canadian archives) took the family to Ottawa. William found work as a clerk in the same department and by 1874 as a draftsman in the Department of Public Works, attached to the office of the chief architect, Thomas Seaton Scott*. In September 1876 he executed a set of pen-and-ink drawings of Quebec City commissioned by Governor General Lord Dufferin [Blackwood*] through Scott. 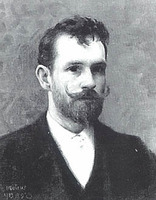 With financial support from his father, Brymner sailed for Europe in February 1878 to study architecture. He settled in Paris, where initially he worked as an exhibition designer for the Canadian commissioner to the universal exposition held there that year. The following summer he took drawing lessons with Charles-François Pinot. In October he enrolled at the Académie Julian, studying with Jules-Joseph Lefebvre and Gustave Boulanger. Newly committed to painting, he continued at Julian’s until 1880 with Tony Robert-Fleury and Adolphe-William Bouguereau. In April 1879 he had begun independent studies with Charles Durand, known as Carolus-Duran, and he supplemented this instruction with anatomy courses at the École des Beaux-Arts. Brymner embraced French academic tenets of good draftsmanship, formal harmony, and technical excellence, but reacted against the artificiality of much studio-produced academic painting on grand themes. He early affiliated himself with a group of contemporary naturalist painters inspired by the Barbizon School, and led by Jean-François Millet, adopting their practice of sketching in rural settings in a quest for picturesque subjects and natural effects. During the summer of 1879 he painted in the French and Belgian countryside. 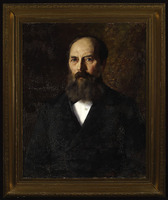 Brymner returned to Ottawa in the summer of 1880 and accepted the position of headmaster at the new Ottawa Art School. That winter he tried his hand at etching, producing his only known print, Old man painting at the Louvre, Paris. Teaching helped fund a second trip to France in May 1881, but rheumatic fever forced his return in October to Ottawa, where he spent the winter recovering. In April 1882 he sent his first works to the annual exhibitions of the Art Association of Montreal (AAM) and the Royal Canadian Academy of Arts (RCA), held jointly that year in Montreal. He returned to the Ottawa Art School in the fall of 1882. In May 1883 Brymner was made an associate of the RCA. The summer found him back in France, sketching at Pontaubert with British painter Frederick Brown. He also visited Yorkshire, England, where he returned the following May for seven months. 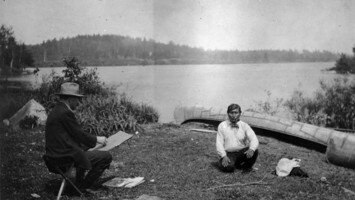 Here he painted with British artist Frederick William Jackson and Canadian-born James Kerr Lawson. 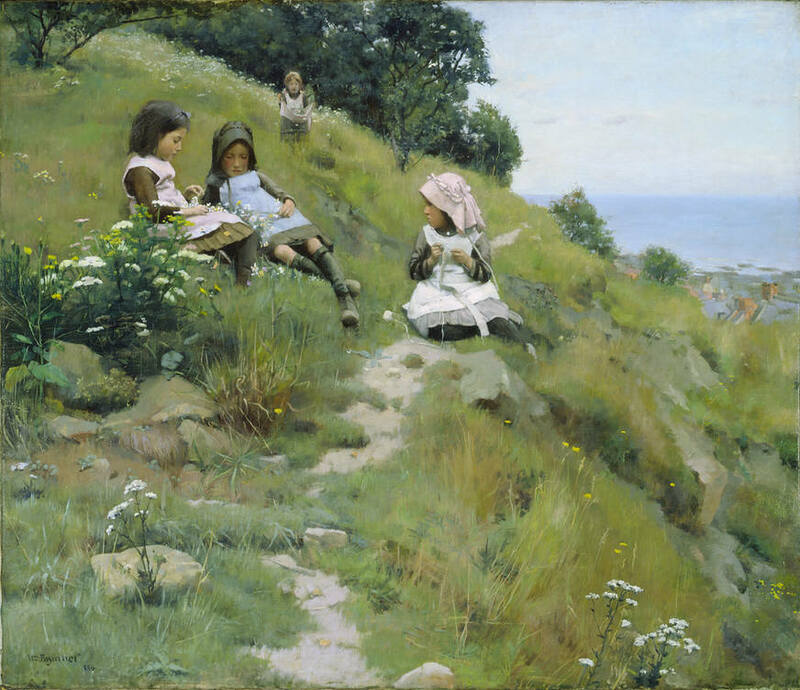 At Runswick Bay he painted his first major canvas, A wreath of flowers, which he would send to the exhibition of the RCA in 1885. 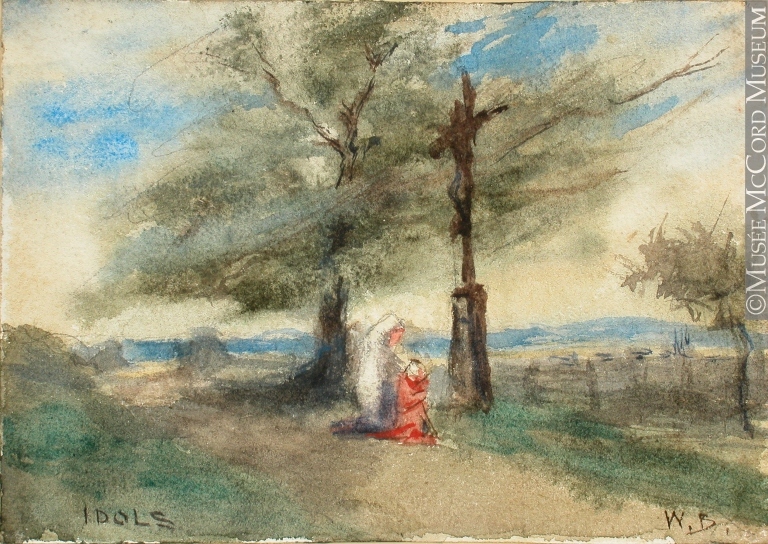 Based on outdoor life studies, this picture typifies Brymner’s youthful style, showing his early narrative interests and demonstrating his mastery of the human figure and landscape and his refined tonal naturalism. In January 1885 he concluded his studies at the Académie Julian and went sketching at Brolles, in the forest of Fontainebleau. The acceptance of Border of the Forest Fontainebleau to the annual Paris Salon in May firmly established his professional credentials. Brymner spent the summer of 1885 in Canada, travelling in the Baie-Saint-Paul region of Quebec. Applying French methods to Canadian subjects, he produced some of his best work around this time, including Sad memories and The weaver, painted at Baie-Saint-Paul, and Crazy patchwork (1886), portraying his younger sister. 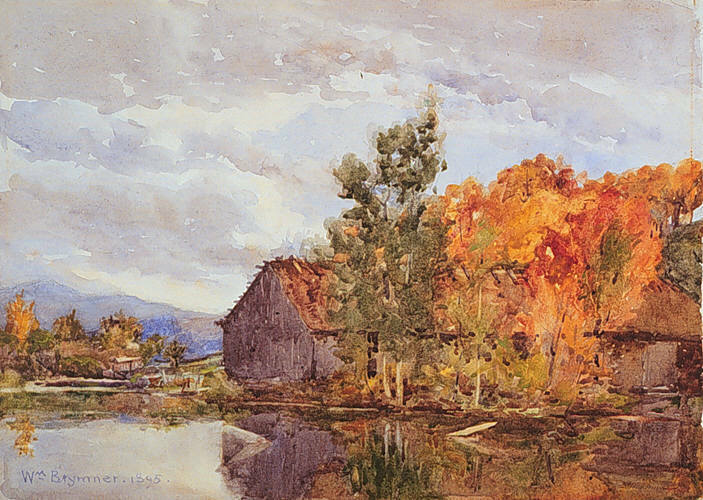 He quickly built a reputation as one of the outstanding Canadian figure and landscape painters of his generation. In February 1886 he was elected a full member of the RCA. His diploma piece, A wreath of flowers, was one of four of his paintings featured in the Canadian section of the Colonial and Indian Exhibition held that summer in London, England. The same year he became a member of the Ontario Society of Artists. After a trip by train through western Canada, during which he painted at the Blackfoot Indian Reserve in Gleichen (Alta) and in the Selkirk Mountains, he accepted an appointment as director of the AAM’s school of art. 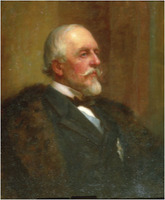 He would hold the post from 1886 to his retirement in 1921. 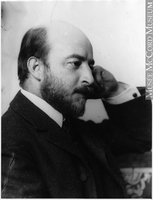 A respected and benevolent teacher, Brymner was reportedly “universally beloved by students and confreres, not only for his craftsmanship, but also for his kindly disposition.” He helped introduce French methods and aesthetic concepts to a new generation of Canadian artists, among them Clarence Gagnon*, Alexander Young Jackson*, and members of the Beaver Hall Hill Group, such as Lilias Torrance* (Newton). He emphasized drawing as “the foundation of all the graphic and plastic arts,” and the importance of direct observation of nature. While faithful to his own academic training, he championed freedom of artistic expression for others. As Jackson recalled, Brymner “was no radical, but he encouraged his students to be independent. . . . Among his fellow academicians he would stand for no intolerance or injustice toward the younger artists.” Based in Montreal, Brymner divided his time between winter teaching duties and holidays spent painting in Europe and Canada. In the summer of 1889 he returned to France; in 1891 he painted in Killarney (Republic of Ireland) with Canadian James Macdonald Barnsley. He travelled to the Canadian Rockies in the summer of 1892 on a major commission for the Canadian Pacific Railway to produce scenic views for public display, some of which were exhibited at the World’s Columbian exposition in Chicago in 1893. He returned west the next year to work in Field and Glacier, B.C., and in Gleichen. 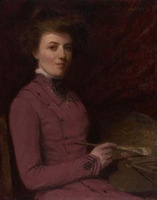 By the 1890s Brymner had developed a distinct personal style. Landscape painting was a primary interest, but he also produced some notable genre and portrait paintings. As exemplified by Early moonrise in September (1899), his interpretation of the Canadian landscape grew more painterly and concerned with atmospheric effects. A similar trend towards intimate, evocative portrayals occurs in his figure paintings, many executed in watercolour, his preferred medium in these years. The grey girl (1897) and The picture book (Two girls reading) (1898), both watercolour on linen, bear comparison with the tonal compositions of James Abbott McNeill Whistler. 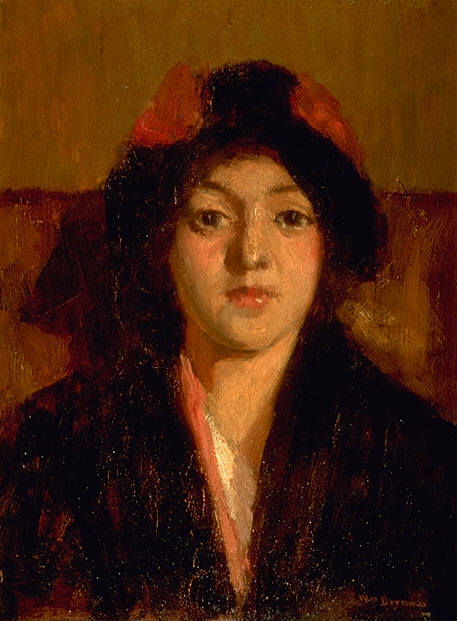 Trips to Venice in 1901 and 1902, where he painted with James Wilson Morrice and Maurice Galbraith Cullen*, and to sunny Martigues, France, in 1908 further directed Brymner towards a more impressionistic style. Excursions to the coast of Nova Scotia, including Louisbourg (1909, 1910, and 1914) and Pictou (1912), produced a number of luminous studies of land and sea. 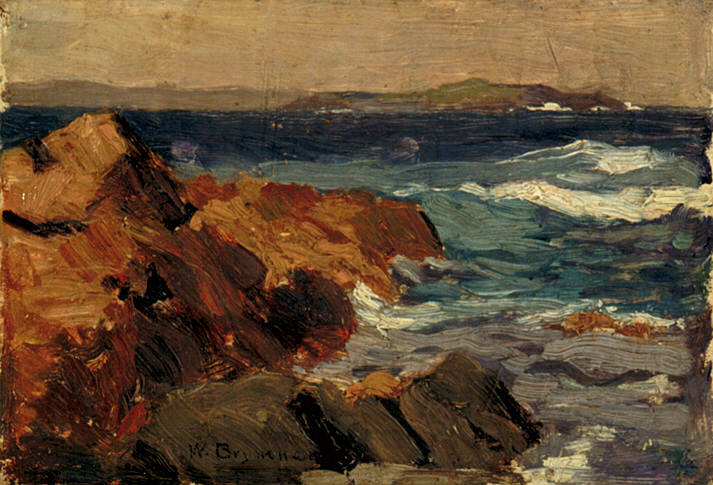 One such painting, Incoming tide, Louisbourg, won the AAM’s Jessie Dow prize in 1915. A commission for a decorative mural cycle for the summer home of Charles E. L. Porteous on the Île d’Orléans, Que., had brought Brymner in 1899 to the Cote-de-Beaupré, where he produced many sketches of the terrain and people of the St Lawrence River valley, serving both for the murals and for new pictures. 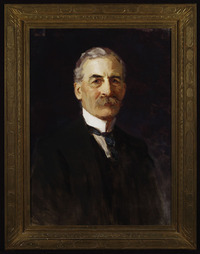 His skills as a muralist brought other commissions, notably in 1907 for three decorative paintings for Edward Seaborne Clouston* and his daughter Mrs John L. Todd at their summer homes in Senneville. A favourite sketching ground in later years was Saint-Eustache, which Brymner had first discovered in 1896 with Cullen and where in 1905 the artists had built a shared studio. Brymner regularly exhibited in the major annual arts exhibitions in Canada, including the Canadian National Exhibition in Toronto, as well as in many international shows. He was a gold and silver medallist respectively at the 1901 Pan-American Exhibition in Buffalo and the 1904 Louisiana Purchase exposition in St Louis. 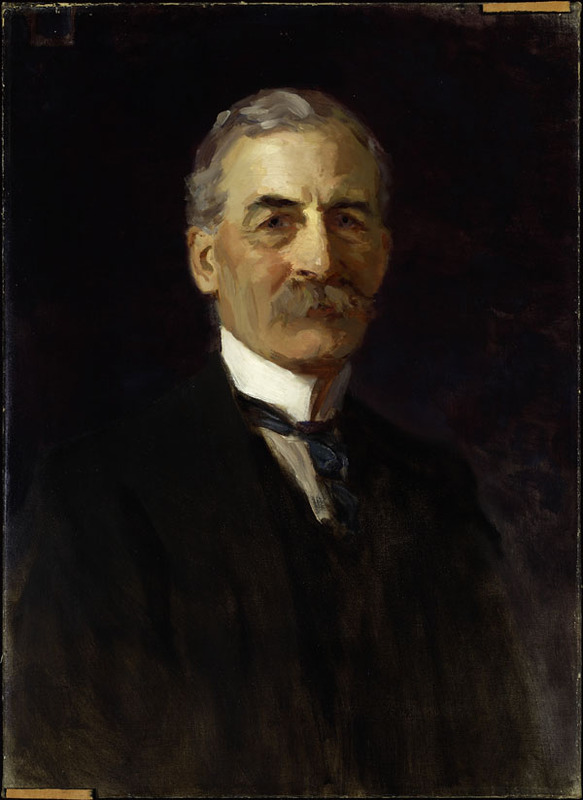 A founding member of the Montreal Water Colour Society (1889) and the Pen and Pencil Club of Montreal (1890, president in 1893), he was active as well in the Toronto-based Canadian Art Club (1908-15) and from 1912 in the Arts Club of Montreal, serving as its president in 1916-17. In 1907 he was elected vice-president of the RCA and in May 1909 he became president. 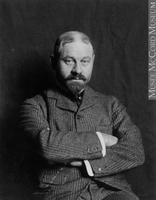 In 1916 he was named a cmg and had a solo exhibition at the Arts Club of Montreal. A stroke in 1917 effectively ended his painting career, however, and forced his resignation as president of the RCA that December. 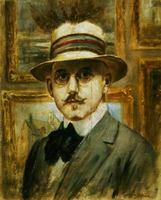 In early 1921, after a second solo exhibition at the Arts Club, he retired from teaching and spent his remaining years travelling, mainly in France and Italy, with his wife. He died while visiting her family in Wallasey, England. The quality and diversity of his art work as well as his many contributions as an art teacher earned Brymner a reputation as one of the major Canadian artists of his generation. Works by William Brymner are held in public and private collections across Canada, including the Agnes Etherington Art Centre, Queen’s Univ., Kingston, Ont. ; the Art Gallery of Hamilton, Ont. ; the Beaverbrook Art Gallery, Fredericton; the Art Gallery of Ontario, Toronto; the McCord Museum of Canadian Hist., Montreal, and the Montreal Museum of Fine Arts; the LAC and the National Gallery of Canada in Ottawa; and the Musée National des Beaux-Arts du Québec in Quebec City. His murals for the former Charles E. L. Porteous home remain in situ. Original illustrations by Brymner were published in [Joshua Fraser], Shanty, forest and river life in the backwoods of Canada (Montreal, 1883) and in H. C. Walsh, Bonhomme: French-Canadian stories and sketches (Toronto, 1899). Brymner’s publications include “‘Progress in art’” and “Village life in three countries,” Univ. Magazine (Montreal), 6 (1907): 239-46 and 11 (1912): 309-26. McCord Museum of Canadian Hist., William Brymner papers. National Gallery of Canada, Library, William Brymner file; William Brymner papers. Fern Bayer, The Ontario collection (Markham, Ont., 1984). 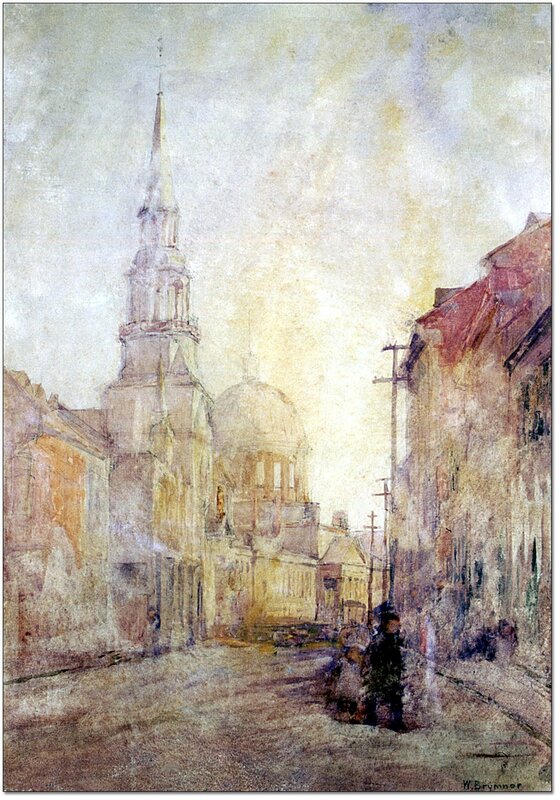 Janet Braide, “Les murales de Brymner à l’île d’Orléans,” Vie des Arts (Montréal), no.97 (hiver 1979-80): 62-65; “A visit to Martiques, summer 1908: impressions by William Brymner,” Journal of Canadian Art Hist. (Montreal), 1 (1974), no.1: 28-32; William Brymner, 1855-1925: a retrospective (exhibition catalogue, Agnes Etherington Art Centre, 1979); “Wreath of flowers,” Journal of Canadian Art Hist., 2 (1975), no.1: 83-84. Canadian encyclopedia. Canadian men and women of the time (Morgan; 1898 and 1912). W. [G.] Colgate, Canadian art, its origin & development (Toronto, 1943; repr. 1967). A dictionary of Canadian artists, comp. C. S. MacDonald (7v. to date, Ottawa, 1967- ), 1. Dale Ethier, “Quebec City and William Brymner,” Archivist (Ottawa), 17 (1990), no.2: 10-11. J. R. Harper, Early painters and engravers in Canada (Toronto, 1970); Painting in Canada, a history ([Toronto], 1966). R. J. Lamb, The Canadian Art Club, 1907-1915 (exhibition catalogue, Edmonton Art Gallery, 1988). David McTavish, Canadian artists in Venice (exhibition catalogue, Agnes Etherington Art Centre, 1979). N. [McF.] MacTavish, The fine arts in Canada (Toronto, 1925; repr., [intro. Robert McMichael], 1973). Montreal Museum of Fine Arts, formerly Art Association of Montreal: spring exhibitions, 1880-1970, comp. E. de R. McMann (Toronto, 1988). National Gallery of Canada, Canadian art (2v., Ottawa, 1988). D. [R.] Reid, A concise history of Canadian painting (Toronto, 1973). A. H. Robson, Canadian landscape painters (Toronto, 1932). Royal Canadian Academy of Arts; exhibitions and members, 1880-1979, comp. E. de R. McMann (Toronto, 1981). Rebecca Sisler, Passionate spirits; a history of the Royal Canadian Academy of Arts, 1880-1980 (Toronto, 1980). Standard dict. of Canadian biog. (Roberts and Tunnell). W. R. Watson, Retrospective: recollections of a Montreal art dealer (Toronto and Buffalo, N.Y., 1974). Victoria Baker, “BRYMNER, WILLIAM,” in Dictionary of Canadian Biography, vol. 15, University of Toronto/Université Laval, 2003–, accessed April 26, 2019, http://www.biographi.ca/en/bio/brymner_william_15E.html.